Mitral stenosis (MS) is a narrowing of the inlet valve into the left ventricle that prevents proper filling during diastole. Patients with mitral stenosis typically have mitral valve leaflets that are thickened, commissures that are fused, and/or sub-valvular structures that are thickened and shortened. See the image below. The most common cause of mitral stenosis is rheumatic fever (RF). Indeed, rheumatic involvement is found in 99% of stenotic mitral valves evaluated at the time of valve replacement. Although rheumatic fever is exceedingly rare today in the United States, the prevalence and consequent morbidity remains significant in impoverished populations and developing countries. In the United States and other developed countries, the progression to mitral stenosis is typically slow, with the onset of symptoms following a latency period of 20-40 years. Once symptoms present, an acceleration of disease may occur. Conversely, in developing countries, rheumatic heart disease can be frequently diagnosed at school age and symptoms often present during the teenage years. The progression of mitral stenosis occurs rapidly relative to the natural history in developed countries; moderate-to-severe disease requiring surgical or endovascular intervention is not uncommon in the teenage years or young adulthood. This early presentation and accelerated course is theorized to be a consequence of recurrent, untreated rheumatic fever. Nearly all mitral stenosis is secondary to the sequelae of rheumatic fever, especially in the developing world. Other causes are rare and include mucopolysaccharoidoses, severe annular calcification, congenital deformities (which usually require intervention in infancy or early childhood), diseases of serotonin metabolism, methysergide therapy, and systemic autoimmune disease (eg, systemic lupus erythematous, rheumatoid arthritis). 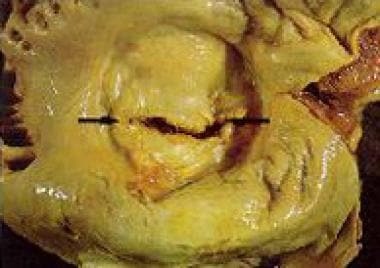 [2, 3] Left atrial myxoma, ball-valve thrombus, infective endocarditis, and cor triatriatum may mimic mitral stenosis. Development of rheumatic fever, the autoimmune disease that is the most common cause of mitral stenosis, requires both a genetically susceptible individual and infection by specific rheumatogenic strains of Group A Streptococcus (GAS). [4, 5, 6, 7, 8] Antibodies produced against the M proteins of these certain strains of GAS cross-react with cardiac tissue. Pathologic examination of the mitral valve at this time reveals proliferation of fibroblasts and macrophages. The normal area of the mitral valve orifice is 4-6 cm2. [2, 3] This effectively creates a common chamber between the left atrium and the left ventricle in diastole. In early diastole, a small and brief pressure gradient is present; however, during most of the filling period, the pressures in the two chambers are equal. Narrowing of the valve area to less than 2.5 cm2 impedes the free flow of blood and requires increased left atrial pressure (LAP) to ensure normal transmitral flow. Symptoms typically first present after exertion when the valve area shrinks to less than 2.5 cm2, and symptoms at rest do not begin until valve area reaches 1.5 cm2. [2, 3] However, any physiologic stress requiring increased cardiac output (eg, pregnancy, infection, exercise, emotional stress, anemia, atrial fibrillation with rapid ventricular response) may precipitate symptoms earlier in the progression of stenosis. Severe mitral stenosis occurs when the opening is reduced to 1 cm2. At this stage, a mean LAP of 25 mm Hg is required to maintain a normal cardiac output. With progressive stenosis, critical flow restriction reduces left ventricular preload and output. The increase in LAP also enlarges the left atrium and raises pulmonary vascular pressures. The resulting pulmonary congestion and reduced cardiac output can mimic primary left ventricular failure. However, left ventricular contractility is normal in most cases of isolated mitral stenosis. [12, 10] As the disease evolves, chronic elevation of the LAP eventually leads to pulmonary hypertension, tricuspid and pulmonary valve incompetence, and secondary right heart failure. Attempts to estimate the prevalence of rheumatic heart disease and mitral stenosis in the developing world have been hindered by inconsistent diagnostic criteria and methods of diagnosis, limited access to appropriate diagnostic tools, and under-reporting. [17, 18, 19, 20, 21] The reported prevalence of rheumatic heart disease in a recent study of randomly selected schoolchildren in southeast Asia and sub-Saharan Africa using both Echo-Doppler and echocardiographic morphologic criteria was reported to be 30.4 cases per 1000 children in Mozambique and 21.5 cases per 1000 children in Cambodia. However, only 15-20% of the total rheumatic heart disease in a given population is in schoolchildren. [14, 20] Therefore, even the estimates in Mozambique and Cambodia, using up-to-date modalities and diagnostic criteria, may underestimate true prevalence. Kumar RK, Tandon R. Rheumatic fever & rheumatic heart disease: the last 50 years. Indian J Med Res. 2013 Apr. 137(4):643-58. [Medline]. [Full Text]. Bonow RO, Carabello BA, Kanu C, et al. ACC/AHA 2006 guidelines for the management of patients with valvular heart disease: a report of the American College of Cardiology/American Heart Association Task Force on Practice Guidelines (writing committee to revise the 1998 Guidelines for the Management of Patients With Valvular Heart Disease): developed in collaboration with the Society of Cardiovascular Anesthesiologists: endorsed by the Society for Cardiovascular Angiography and Interventions and the Society of Thoracic Surgeons. Circulation. 2006 Aug 1. 114(5):e84-231. [Medline]. Chandrashekhar Y, Westaby S, Narula J. Mitral stenosis. Lancet. 2009 Oct 10. 374(9697):1271-83. [Medline]. Guilherme L, Kalil J. Rheumatic fever and rheumatic heart disease: cellular mechanisms leading autoimmune reactivity and disease. J Clin Immunol. 2010 Jan. 30(1):17-23. [Medline]. Sampaio RO, Fae KC, Demarchi LM, Pomerantzeff PM, Aiello VD, Spina GS. Rheumatic heart disease: 15 years of clinical and immunological follow-up. Vasc Health Risk Manag. 2007. 3(6):1007-17. [Medline]. Baltimore RS. Re-evaluation of antibiotic treatment of streptococcal pharyngitis. Curr Opin Pediatr. 2010 Feb. 22(1):77-82. [Medline]. Shulman ST, Tanz RR, Dale JB, et al. Seven-year surveillance of north american pediatric group a streptococcal pharyngitis isolates. Clin Infect Dis. 2009 Jul 1. 49(1):78-84. [Medline]. Libby p, Bonow RO, Zipes DP, Mann DL. Valvular Heart Disease. Libby: Braunwald's Heart Disease: A Textbook of Cardiovascular Medicine. 8th ed. WB Saunders Co; 2007. Carabello BA. Modern management of mitral stenosis. Circulation. 2005 Jul 19. 112(3):432-7. [Medline]. [Guideline] Bonow RO, Carabello BA, Chatterjee K, de Leon AC Jr, Faxon DP, Freed MD, et al. 2008 focused update incorporated into the ACC/AHA 2006 guidelines for the management of patients with valvular heart disease: a report of the American College of Cardiology/American Heart Association Task Force on Practice Guidelines (Writing Committee to revise the 1998 guidelines for the management of patients with valvular heart disease). Endorsed by the Society of Cardiovascular Anesthesiologists, Society for Cardiovascular Angiography and Interventions, and Society of Thoracic Surgeons. J Am Coll Cardiol. 2008 Sep 23. 52(13):e1-142. [Medline]. Gash AK, Carabello BA, Cepin D, Spann JF. Left ventricular ejection performance and systolic muscle function in patients with mitral stenosis. Circulation. 1983 Jan. 67(1):148-54. [Medline]. Shulman ST, Stollerman G, Beall B, Dale JB, Tanz RR. Temporal changes in streptococcal M protein types and the near-disappearance of acute rheumatic fever in the United States. Clin Infect Dis. 2006 Feb 15. 42(4):441-7. [Medline]. Carapetis JR. Rheumatic heart disease in developing countries. N Engl J Med. 2007 Aug 2. 357(5):439-41. [Medline]. Nkomo VT, Gardin JM, Skelton TN, Gottdiener JS, Scott CG, Enriquez-Sarano M. Burden of valvular heart diseases: a population-based study. Lancet. 2006 Sep 16. 368(9540):1005-11. [Medline]. Rahimtoola SH. Mitral valve disease. Hurst's The Heart. 12th ed. McGraw-Hill Medical Publishing Division; 2008. chap 77.
WHO. Rheumatic Fever and Rheumatic Heart Disease: Report of a WHO Expert Consultation, Geneva, 29 October - 1 November 2001. 2004. Marijon E, Celermajer DS, Tafflet M, El-Haou S, Jani DN, Ferreira B. Rheumatic heart disease screening by echocardiography: the inadequacy of World Health Organization criteria for optimizing the diagnosis of subclinical disease. Circulation. 2009 Aug 25. 120(8):663-8. [Medline]. Carapetis JR, Steer AC, Mulholland EK, Weber M. The global burden of group A streptococcal diseases. Lancet Infect Dis. 2005 Nov. 5(11):685-94. [Medline]. Tadele H, Mekonnen W, Tefera E. Rheumatic mitral stenosis in Children: more accelerated course in sub-Saharan Patients. BMC Cardiovasc Disord. 2013 Nov 1. 13(1):95. [Medline]. Atak R, Yetkin E, Yetkin O, et al. Increased systemic and regional coagulation activity in patients with mitral stenosis and sinus rhythm. Angiology. 2003 Sep-Oct. 54(5):593-7. [Medline]. Carroll JD, Feldman T. Percutaneous mitral balloon valvotomy and the new demographics of mitral stenosis. JAMA. 1993 Oct 13. 270(14):1731-6. [Medline]. Zehtabchi S, Brandler ES. Evidence-based emergency medicine/rational clinical examination abstract. Does this patient have congestive heart failure?. Ann Emerg Med. 2008 Jan. 51(1):87-90. [Medline]. Wunderlich NC, Beigel R, Siegel RJ. Management of Mitral Stenosis Using 2D and 3D Echo-Doppler Imaging. JACC Cardiovasc Imaging. 2013 Nov. 6(11):1191-205. [Medline]. Guven S, Sen T, Tufekcioglu O, Gucuk E, Uygur B, Kahraman E. Evaluation of left ventricular systolic function with pulsed wave tissue Doppler in rheumatic mitral stenosis. Cardiol J. 2013 Dec 2. [Medline]. Zamorano J, de Agustin JA. Three-dimensional echocardiography for assessment of mitral valve stenosis. Curr Opin Cardiol. 2009 Sep. 24(5):415-9. [Medline]. Matthys J, De Meyere M, van Driel ML, De Sutter A. Differences among international pharyngitis guidelines: not just academic. Ann Fam Med. 2007 Sep-Oct. 5(5):436-43. [Medline]. [Guideline] Gerber MA, Baltimore RS, Eaton CB, Gewitz M, Rowley AH, Shulman ST. Prevention of rheumatic fever and diagnosis and treatment of acute Streptococcal pharyngitis: a scientific statement from the American Heart Association Rheumatic Fever, Endocarditis, and Kawasaki Disease Committee of the Council on Cardiovascular Disease in the Young, the Interdisciplinary Council on Functional Genomics and Translational Biology, and the Interdisciplinary Council on Quality of Care and Outcomes Research: endorsed by the American Academy of Pediatrics. Circulation. 2009 Mar 24. 119(11):1541-51. [Medline]. [Guideline] Wilson W, Taubert KA, Gewitz M, et al. Prevention of infective endocarditis: guidelines from the American Heart Association: a guideline from the American Heart Association Rheumatic Fever, Endocarditis, and Kawasaki Disease Committee, Council on Cardiovascular Disease in the Young, and the Council on Clinical Cardiology, Council on Cardiovascular Surgery and Anesthesia, and the Quality of Care and Outcomes Research Interdisciplinary Working Group. Circulation. 2007 Oct 9. 116(15):1736-54. [Medline]. Carabello BA, Crawford FA Jr. Valvular heart disease. N Engl J Med. 1997 Jul 3. 337(1):32-41. [Medline]. Chiang CW, Lo SK, Ko YS, et al. Predictors of systemic embolism in patients with mitral stenosis. A prospective study. Ann Intern Med. 1998 Jun 1. 128(11):885-9. [Medline]. Itoh A, Kobayashi J, Bando K, et al. The impact of mitral valve surgery combined with maze procedure. Eur J Cardiothorac Surg. 2006 Jun. 29(6):1030-5. [Medline]. Massie BM, Granger CB, McPhee SJ. Valvular heart disease. Tierney's: Current Medical Diagnosis & Treatment. Online Eds. 2005. Reyes VP, Raju BS, Wynne J, et al. Percutaneous balloon valvuloplasty compared with open surgical commissurotomy for mitral stenosis. N Engl J Med. 1994 Oct 13. 331(15):961-7. [Medline]. Selzer A, Cohn KE. Natural history of mitral stenosis: a review. Circulation. 1972 Apr. 45(4):878-90. [Medline]. Stoltz C, Bryg RJ. Mitral stenosis. Crawford's: Current Diagnosis & Treatment in Cardiology. 2nd ed. McGraw-Hill Co; 2003. chap 10. Mukherjee C, Holzhey D, Mende M, Linke A, Kaisers UX, Ender J. Initial experience with a percutaneous approach to redo mitral valve surgery: Management and procedural success. J Cardiothorac Vasc Anesth. 2015 Aug. 29(4):889-97. [Medline]. Mukherjee S, Jagadeeshaprasad MG, Banerjee T, et al. Proteomic analysis of human plasma in chronic rheumatic mitral stenosis reveals proteins involved in the complement and coagulation cascade. Clin Proteomics. 2014. 11(1):35. [Medline]. Echocardiography of mitral stenosis. Courtesy of Michael B. Stone, MD, RDMS. The authors and editors of Medscape Drugs & Diseases gratefully acknowledge the contributions of previous authors, Yiju Teresa Liu, MD, and Richard H Sinert, DO, to the development and writing of this article.